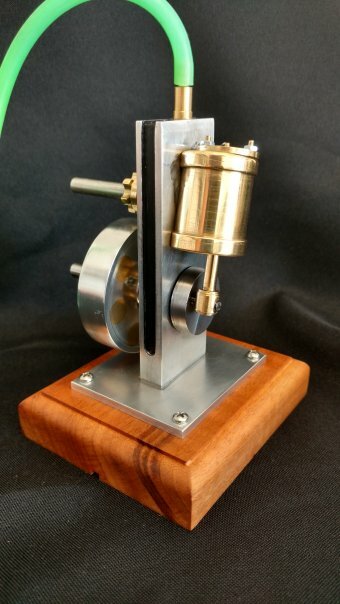 Simple Oscillating Engines - made by other Engineers. 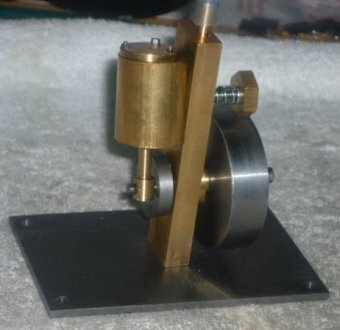 This page features engines built by other people who have made models based on the simple oscillator plans. This fine model was built by Bob and he reported good performance. Bob built the model exactly to the plans with the exception of the pivot nut, which used a plain shaft with a collar and securing grub screw. This engine was built by Marc from Belgium. Mark made his model from all aluminium parts with good results. 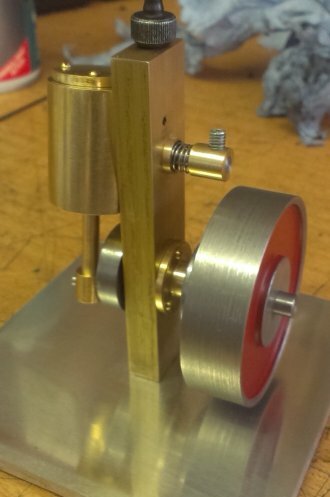 Malcolm in the U.k. made this fine example using a mix of Aluminium and brass parts. It had a particularly nicely finished base. Malcolm plans to make the flywheel more authentic by recessing the side faces and adding some lightening holes. 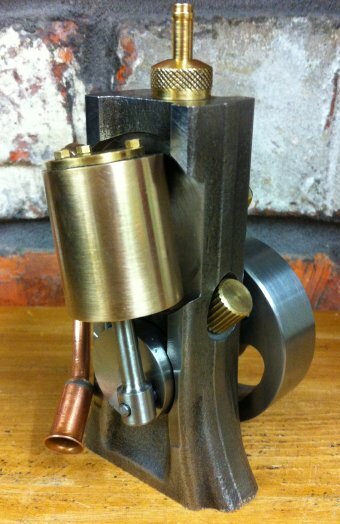 Stewart from the U.K. made this engine as part of his metalwork studies. Stewart worked very closely to the plans including making his own pivot nut, but enhanced the design with a dished flywheel and recessed band around the cylinder body - nice touch. Stewart reported good performance from his engine which gave high speeds and free running on low air pressure. This is Kevin's engine from New Orleans. Kevin improved the engine by using a ball bearing at the crank. He also used a plain shaft for the pivot with a sliding collar instead of the threaded rod of the original design. 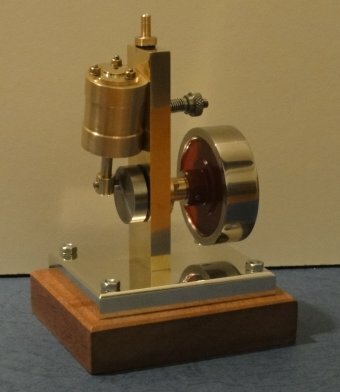 Steve Vine made a very fine job of machining his little oscillator. 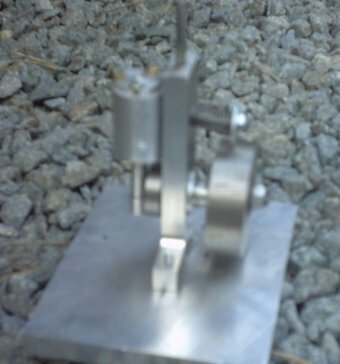 This model was notable for its smart round base and stronger connecting rod. Like some other builders, Steve used a collar on a plain shaft to retain the pivot spring but also included some cups to hold the ends of the spring. Nice work. Steve has reported good performance running his engine on compressed air. 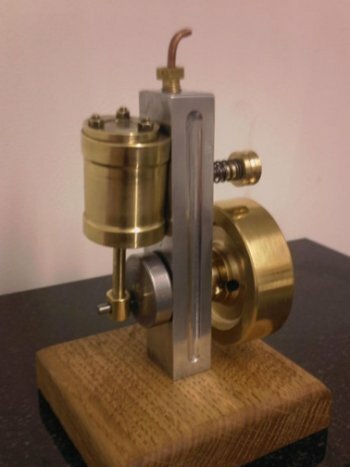 Alasdair built this faithful copy of the oscillating engine and reported good running at both low and high speeds, when running on compressed air. 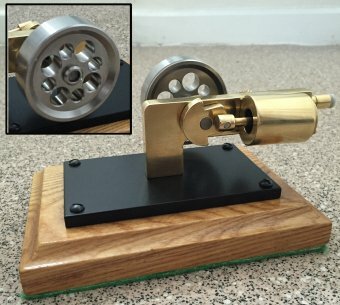 Having completed this model successfully, Alasdair plans to apply his new skills to building a Stuart 10V from castings and later an Allchin traction engine. Rowan not only built the oscillating engine but also a boiler to go with it. The whole plant looks terrific and he reported that the engine runs well. The boiler and fittings were all scratch built by Rowan. 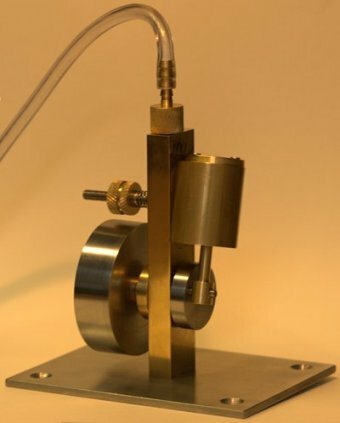 The lagging was made from stained coffee stirrers which look very effective and the regulator is a modified science gas tap. The oak base was made by his uncle. Rowan stated that at full speed the boiler can get exhausted and so he is planning an upgrade to the burner at some point. Good work Rowan, the whole plant looks exceptionally good. 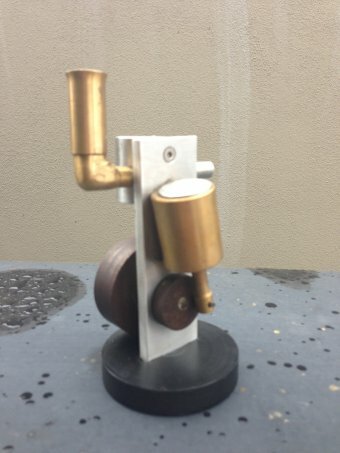 Andrew from York in the UK made this nice copy of the engine. This was his first metalworking project but you wouldn't guess from looking at it - it has turned out really well. Andrew stuck closely to the original plans but added a feature on the knurled nut to locate and hold the pivot spring. WebPages for more pictures and a video of the engine running. Andrew has also written a nifty Java program which can be used to design an oscillating engine and animate the output - very handy. 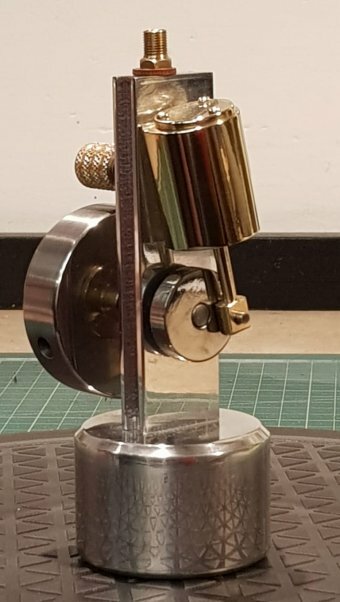 Peter from Sweden sent this picture of his finished engine. It was also his first project in metal working. Peter used square section steel bar for the main frame and also added a pedestal bearing on the end of the crankshaft for extra support. The video shows a nice true running flywheel which is the sign of a job well done. 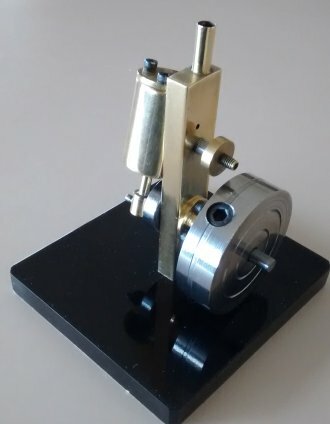 I found this image of the simple oscillating engine on the Model Engineer Forum. I've been unable to contact the builder but I think it was built by someone called David, in the UK. David has made a very fine job indeed, particularly regarding the fluted frame part and the recessed cylinder body. These features make the engine look less like a toy and more like a model. The Brass flywheel looks very tidy too. Like many others here, David has also gone for a pivot nut which is locked in place with a grub screw. 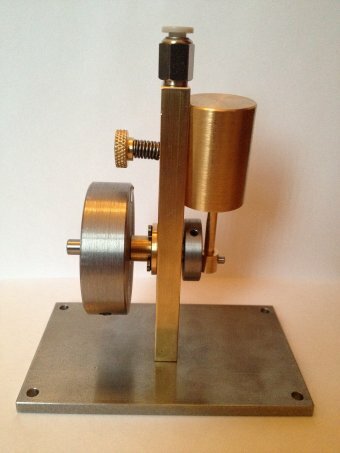 Barry in the UK made this highly polished version of the simple oscillating engine. The design was adapted to suit the materials which were available and it was finished on an oak base. The completed model looks superb. The engine has successfully run on compressed air and Barry said that it performed nice a steady at slow speeds. He also advised that lapping the cylinder port face to the frame helped with efficient running. Having completed the engine Barry intends to use it as a project for his apprentice (see below). Barry has been in touch again and this time included a picture of an engine built by his apprentice, David. 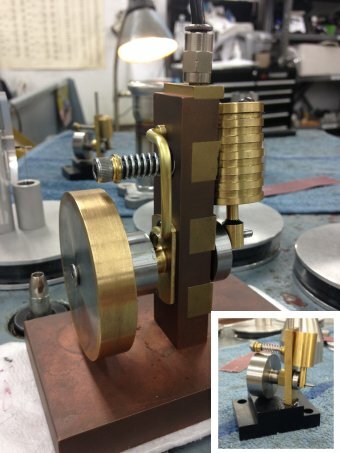 David has also polished the engine to a fine finish and took the opportunity to practice some knurling on the flywheel. Barry said that David found the engine very easy to make, and was delighted with the end result. 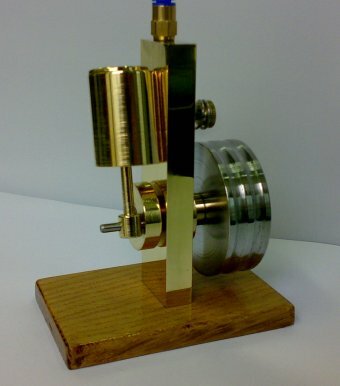 Jose has sent in this picture of his simple oscillating engine. Nice job. The pivot pin has been Loctited in to the cylinder a collar used to tension the spring. Jose has more recently fabricated a spoked flywheel for his engine (inset). Ingeniously, it is made of a bolt head for a hub, nails for spokes and has a wooden rim. Top marks for a clever use of materials. 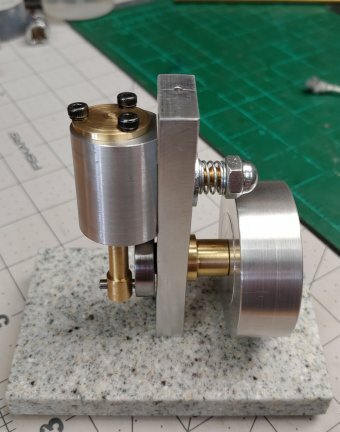 Here is another version of the simple engine made by Jim. 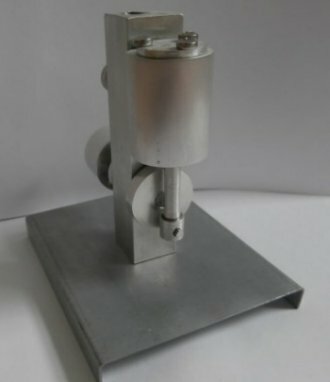 This was a learning project for Jim, but he still made a fine job of the machining and he reported that it worked first time. 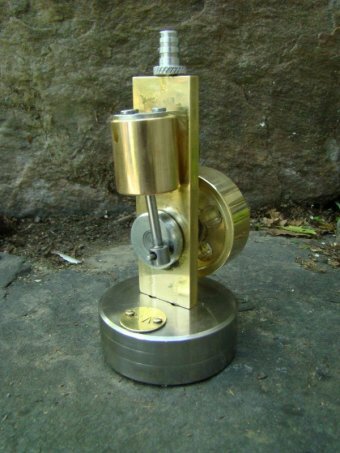 The flywheel is particularly attractive with its polished finish and recessed faces. The base was also nicely finished and Jim has added some cylinder details and used studs instead of screws for the cylinder cap. 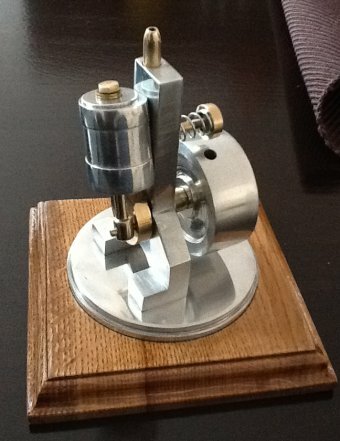 Alex from Romania sent in this aluminium version of the engine. Alex has made a fine job of the machining and has formed a much more elaborate frame design, with a more complex profile and mounting feet. Alex also sent a video of the engine running and it runs very fast and smooth on a supply of compressed air. Next on the project list is a pulse jet ! 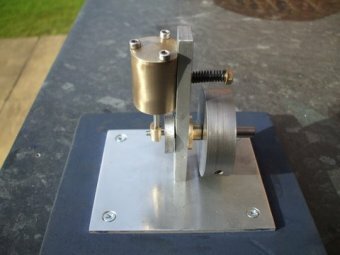 "I've built this as my first project, I enjoyed the build and learnt a lot; and it ran first time. Thanks for the plans." You're welcome Bob and the engine looks excellent. 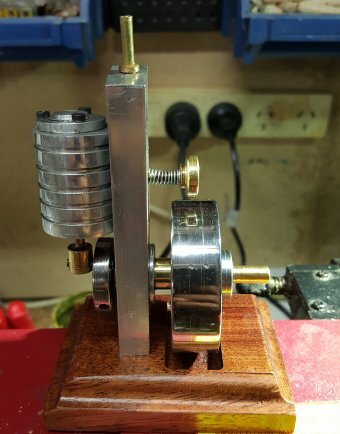 Wim from Holland sent in this picture of his build and although it looks professional it was actually his first machining project. Wim used a combination of aluminium and brass materials, all polished to a high finish. The engine worked first time. It looks great and the laminated base is a nice idea. 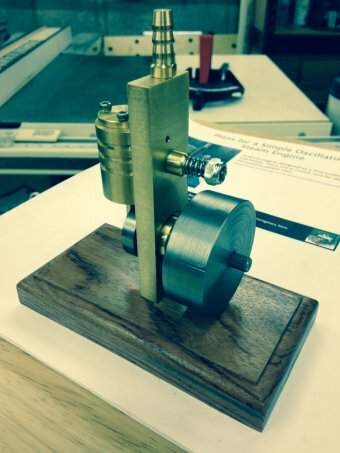 Amar made this engine as part of his work towards a Level 3 BTEC qualification. 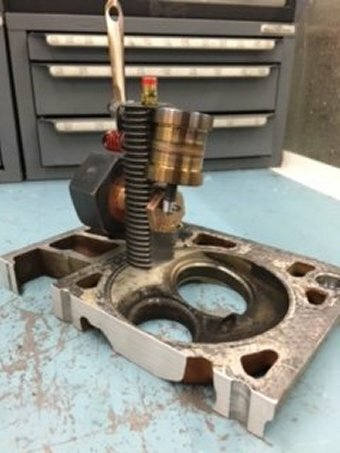 He used a CNC program to produce the parts and also incorporated a closed end cylinder which removed the need for an end cap and eliminated the possibility of leaks from a gasket. Amar is planning to take up an apprenticeship to further his engineering career. Good luck Amar. This finely decorated engine was made by Leonardo from Brazil. 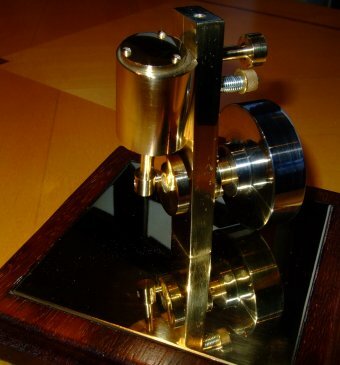 As well as brass Leonardo used aluminium and blackened steel for different parts and a wooden base. 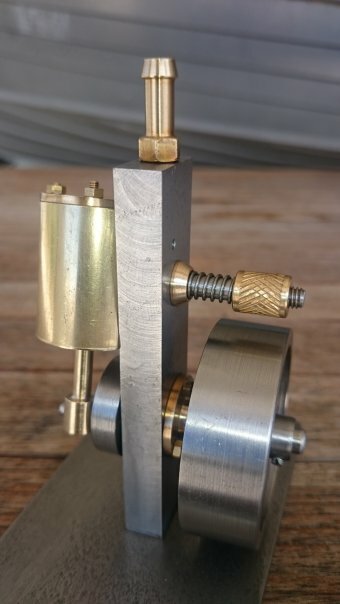 Barry from Belgium made this as his first machining project. Initial construction was plague with lath quality issues but in the end Barry got a good working engine. He also added and oil hole to the bearing housing which is a great idea. The end result looks really good Barry. 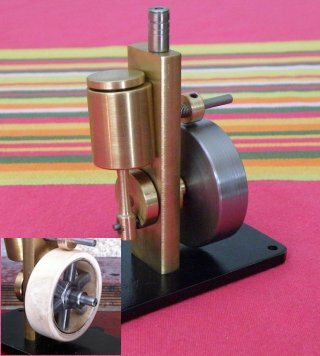 Tom from Scotland is an experienced engine restorer but this was his first Lathe build project. The engine has a highly polished finish on all parts and looks great. Tom modified the design to have a silencer on the exhaust and secured the flywheel to the axle with a tapered pin as is done with full size engines. Tom reported that the engine runs well at speed or tick over. 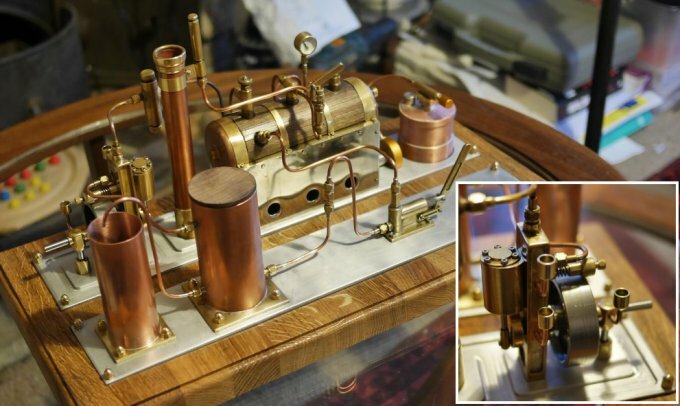 Hessel from Holland built this version of the oscillating engine. The engine is finished to a high polish and was reported to run well at just 1/4 bar air pressure. Hessel modified the inlet to be at the bottom of the engine frame which looks much neater and is a better location away from moving parts. He also engraved a signature plaque. Nice one Hessel. Chris made his engine from scrap material and made a number of modifications to enable him to use a thinner frame. Really like the exhaust pipe. Chris states that this was his first build and next he plans to make an internal combustion engine. The flywheel has been enhanced with some spoke holes and the round base looks just nice. The engine runs well on compressed air and so now the builder intends to make a boiler. and was part of Tim's high school studies. Tim Made an interesting modification to control the engine speed. The black screw shown in the side of the frame is in fact a needle valve as shown on the insert sketch. 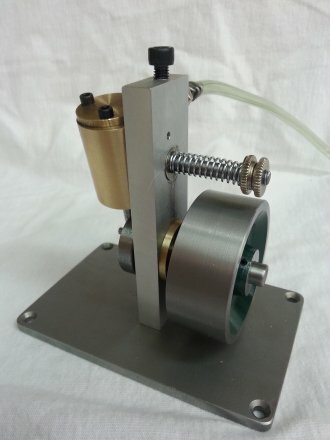 This allows the flow rate to be controlled to set the engine speed - nice idea. Jim is a motor sport engineer by trade, but this was his first model engineering build. He got the engine to run well on compressed air in fact it ran so fast that the pivot nut came undone! See a video of the engine (and the incident) Here. Next Jim plans to make Elmer's No33 mill engine. Johannes from made this copy of the engine to develop his machining skills. Here it is prior to the fitting of he flywheel. Johannes had problems getting the engine to run initially but after some polishing of the working surfaces it ran really well. See a video of it running Here. This really nice engine was made by Rob. Rob used a JCB connecting rod for the frame which is not only innovative, but it looks great with its rough cast surfaces. Other additions included a crankshaft oil feed shown on the right here and a cool looking exhaust from copper tube. The engine runs very sweetly on 35psi of air. Rob sent me a video of the engine running here and you could hear it running with a strong beat which is a sign of an engine with good compression. Paul from the UK's engine is shown here. This is Paul's first model and another nice build. Minor modifications included a boss on the flywheel and spring recess built into the locking collar. It must be a nice free running engine as Paul has had it working on a bicycle pump. Painted flywheel recess is a nice touch. This is John's copy of the steam engine and the second engine he has ever built. John used it to enhance his knowledge of model engineering. Everything was kept as close to the original design as possible and John says it ran very well. Looks really good John. A nice combination of materials and a particularly nice base. John's next project will be a Stuart 10v. Andrea from Italy built this fine engine based on the original plans. 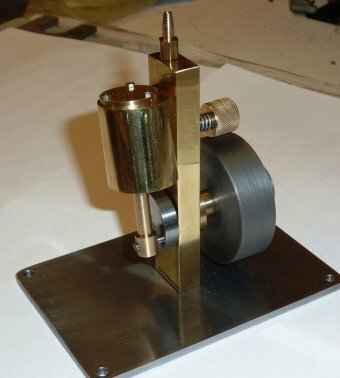 This is Andrea's first machining project and unbelievably was built without the use of a lathe. Instead the machine was made using hand tools and a homemade mill. 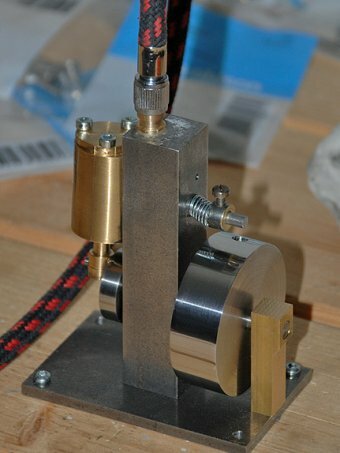 The engine has been run successfully on 1bar of pressure. Nice work Andrea; the counter balanced crank disc looks great, and the recessed base is a nice touch. 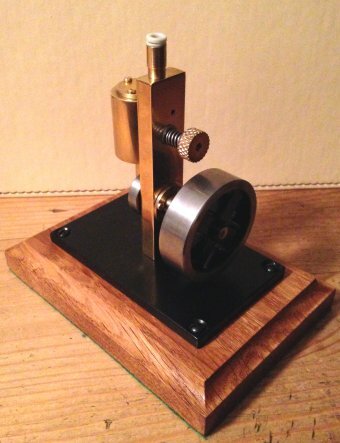 This is Steve's oscillating engine, built exactly to the plans with the exception of the boss for the flywheel. 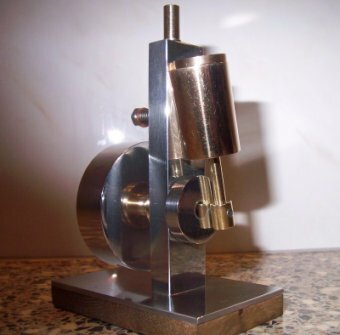 This was Steve's first technical engineering project, and it was made on a Myford Super 7 lathe. 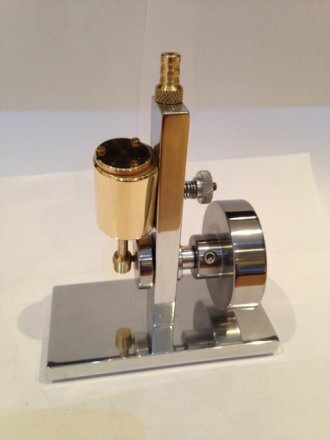 A mixture of aluminium steel and brass parts were used, all polished up to good effect. It's a nice looking engine. There is a video of the engine running on compressed air Here. Steve is planning a boiler next, to get the engine working on steam. This is Larry's engine and it was his first steam engine build. Larry reported that the final engine ran smoothly on compressed air. As well as some material differences, Larry changed the port layout to include a needle valve to control the speed; the flywheel was improved with a recessed rim and mounting boss, and he added a pair of knurled nuts on the pivot bar. Looks great Larry and the flywheel reminds me of a marine style engine. Andrew is only 16 years of age and he built this working engine as part of his school studies (mostly on Thursday lunchtimes!). The material used was aluminium and some dimensions were changed to fit the stock which was available. Andrew has had the engine running on compressed air and plans a boiler build next to get it steaming. 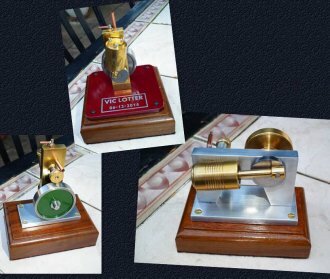 Vic from South Africa made not one, but three engines from the plans. Over the Christmas break Vic turned his scrap bin into these finely finished models including a rather nice horizontal version of the design. Clearly a talented machinist, Vic also has some bike as car restorations underway. Jordan from the UK made this copy of the engine sticking faithfully to the original plans with the exception of the flywheel, which was more ornate. 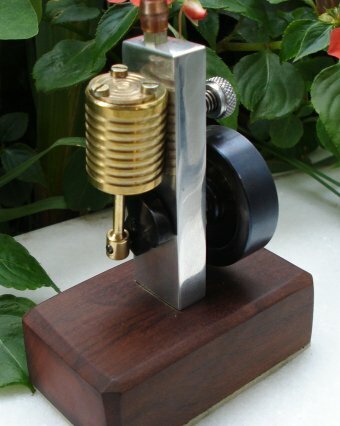 A nice looking engine and the wooden base helps it to look great. 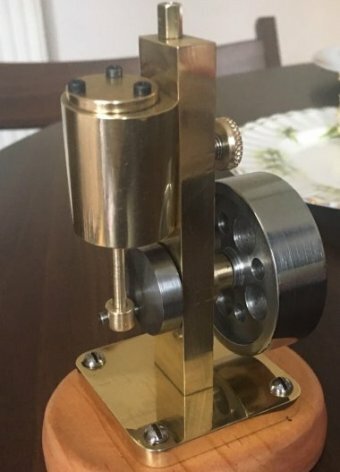 Emma from Australia made this version of the engine. Emma also took the time to produce a comprehensive video series on the build. A very useful reference for anyone else thinking of building the engine. This is a picture of Callum's engine. Surprisingly it was made with just 3 hours of workshop time. Made from parts from the scrap bin it has a 'Steam Punk' look about it; the mixture of materials works really well. This build was seen whilst on the U.K. model engineering forum. 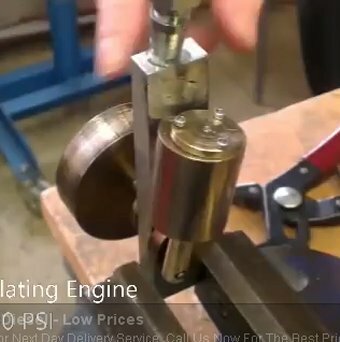 Gary from Manchester built this copy of the engine. The flywheel has a nice mounting boss on it and the double locking nut looks neat on the pivot pin. 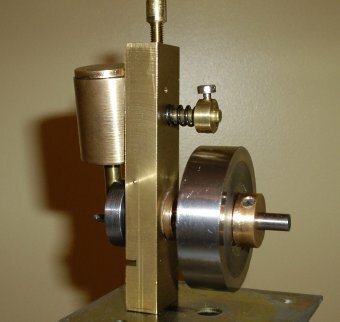 Gary built his engine on a small Sieg lathe and now plans to make a Stuart S50 mill engine. Another Gary from South Wales and another Forum photograph. I came across this by accident whilst looking for information on building the Stuart Victoria which is something Gary has now completed. 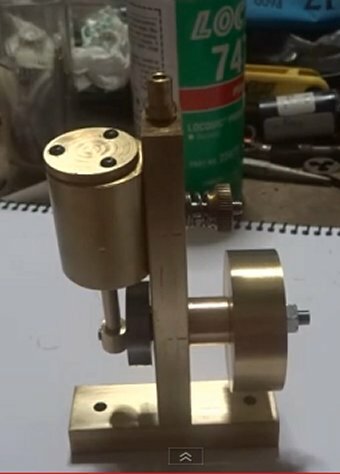 This build was made before the Stuart one, to learn some basic machining. It features a very nice base and bossed flywheel design. The Stuart Victoria discussion is a useful reference and it can be found Here. Jordan has been in touch again having completed a horizontal version of the engine. It's another nicely finished model and the stainless flywheel is particularly fine with the different hole diameters and chamfered rim. The model also has a counterbalanced crank web. 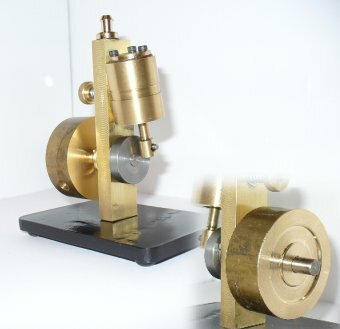 It is the first machining project that Kenn has attempted and he reported good performance with the engine running steady on just 5psi of air. There is lots of nice detailing to the model including a fluted column and the grooved cylinder body. The obliquely cut wooden base is inspired. 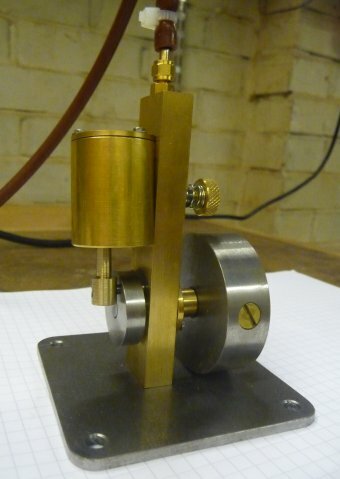 Kenn heat shrunk some aluminium bar onto a brass boss to create a very effective flywheel. It's a very handsome engine. Lewis from Australia is a skilled welder, but he had never tried machining before. He made two engines to this design as he honed his skills as a model engineer. 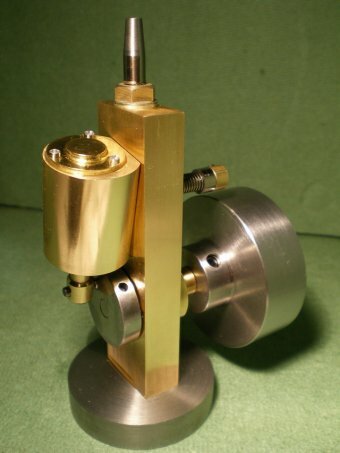 The model was made predominantly from Aluminium with some brass parts and a tasty Tasmanian blackwood base. The plan is to now build a boiler for the engine and install it into a radio controlled boat. Nick made 2 copies of the engine; one full scale and the other half size (see inset). The full scale engine had a number of laminated parts including the flywheel and main frame. The cylinder also included a detailed exterior. The exhaust pipe is an interesting feature as it exits over the main bearing to provide lubrication. The engine has a good finish on all parts. The half scale engine looks cute! The plans were converted to imperial units as he is in the USA. Steve had fun building the engine which was made to learn to use his new lathe and milling machine. This is Salim's engine from South Africa. Salim is a design engineer and recently restored and old ML7 Lathe. 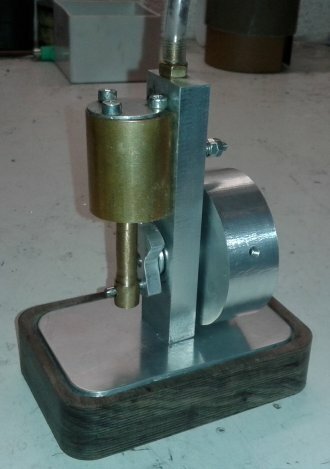 The simple oscillating engine project provided the opportunity to try it out and make a working model. The finished engine is highly polished with some modifications to use the materials on hand and it looks great. Colton made a nice job of machining a working engine from scrap parts in the workshop. A Chevy LS1 head was cut up for the base plate. A 1.25" piece of all-thread was machined for the upright and a 2'' nut was used for the flywheel. The cylinder was actually two pieces of stainless welded together and machined; and it featured a clear plastic on the top so you can see piston working. Colton added a piece of metal to the spring so that pivot tension could be adjusted with the engine running, to fine tune it for the best running conditions. This is Scott's build from the USA. 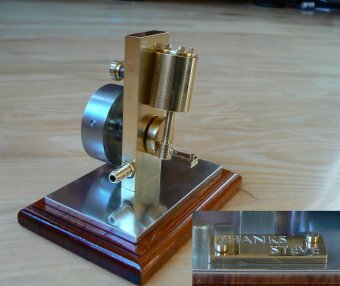 In Scott's own words....."It was a pleasure to create a version of Steve's engine. 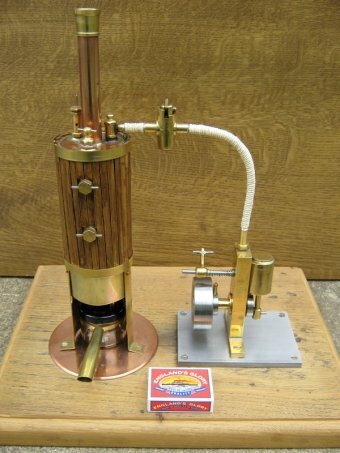 It was my first steam engine and provided a wonderful platform for developing skills. Although, it is a simple engine I found it fun to make some cosmetic enhancements. 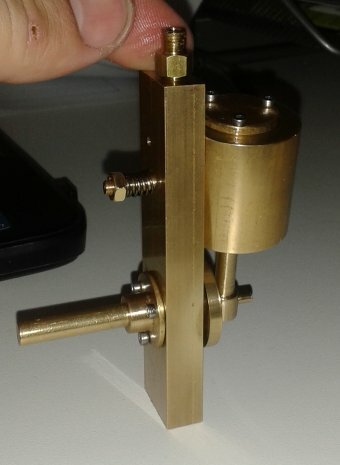 It runs great and I am able to slow it down to around 70 rpm"
Scott is now building a PM research engine #1 as his next project. 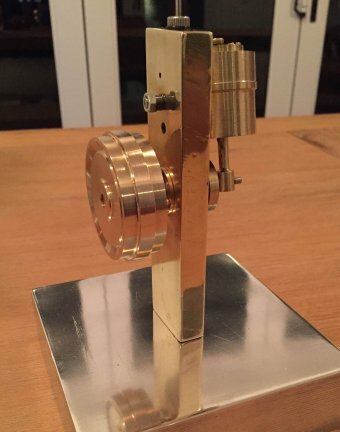 Nice work Scott - particularly like the flywheel with brass inserts and the external cylinder shape. Ken is a retired machinist so knows a thing or two about metalwork. He made his engine faithful to the original plans and it looks very nicely finished. 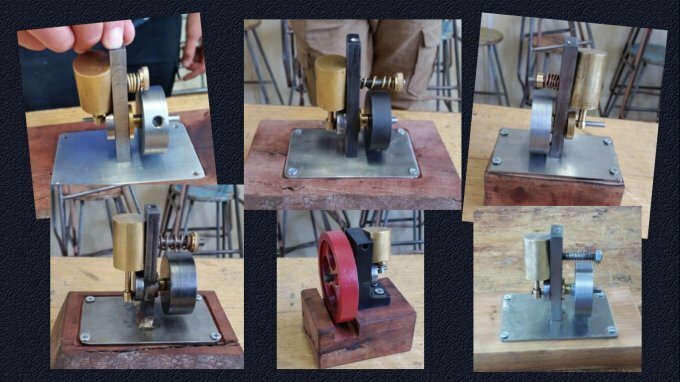 This collection of engines was sent in by Jason who is an engineering tutor at the Kangaroo Island Education college. Kangaroo Island sits just off the South coast of Australia. The engines were made by 15 and 16 year old students at the college. Some of builders worked to the plans exactly and others added their own variations or changed the scale. All the engines look good and hopefully more students will use the plans again in the future. This comprehensive steam plant was built by Phil. The engine was modified to include oil cups for bearings and an additional pedestal bearing to support the free crankshaft end. 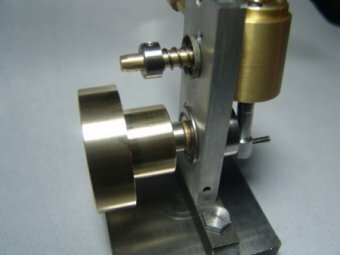 The piston assembly was made in three parts with a bronze piston, stainless con rod and brass small end. The steam plant includes a homemade displacement oiler, super-heater, feed-water heater, condenser, hand pump and clack valves; not to mention a steam regulator and whistle. The boiler is gas fired and Phil made the burner by modifying a camping gas stove, attached to a scratch built tank. It is a very fine model indeed. Phil has plans to fit the steam engine in a model boat next. 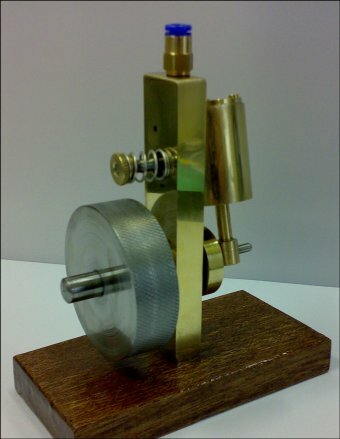 Tim from Australia built this copy of the oscillating engine. 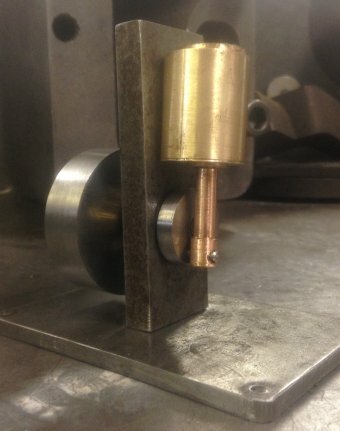 Tim added a bush for the cylinder pivot which had a seat for the spring; and he used brass studs with nuts for the cylinder end cap. After assembly Tim said the engine ran very well. 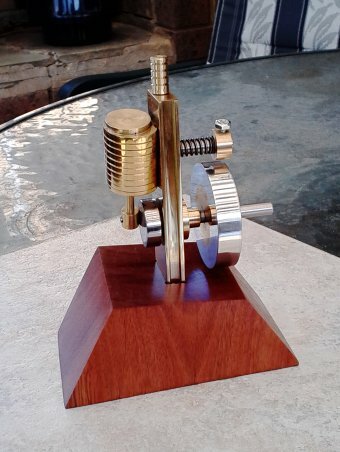 Ron from Australia has been in touch with this build of his engine. Ron made his engine to the plans but also followed Emma's YouTube tutorials on making the parts. Emma's construction episodes can be found here. This was Ron's first model engineering project and he cleverly used a worn out stainless steel target rifle barrel for the cylinder. Ron supplied a video of his engine running on air which shows it turning both fast and slow, and with strong compression. 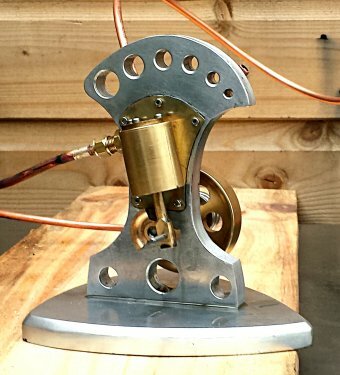 Joe is from Oregon and he made his engine using some alternative materials and metals including a marble base. Joe confirmed that the engine ran well and is now looking forward to an enjoyable winter of model engineering. Next Joe is looking for a castings kit to machine or he might restore an old hit 'n' miss engine if he can find one. 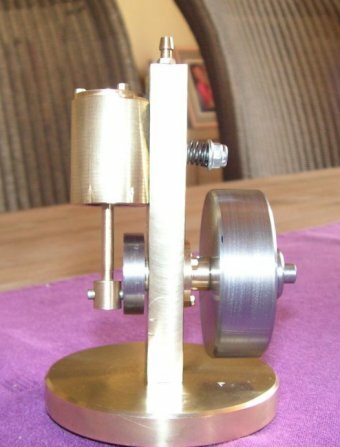 Doug from Hampshire made this highly polished version of the engine. It was built under the guidance of his father and using his father's workshop. The engine ran first time on compressed air - no fettling required! Doug is now starting the 16mm Ellie steam tram and is looking forward to learning more new skills. 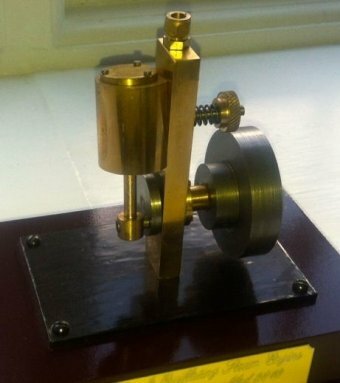 Paul from Wales made this version of the engine. He went with a polished finish and added some nicely spaced and sized holes to the flywheel. The rest of the parts were machined to the original design. This was a first machining project for Paul but he got it runnnig well first time. 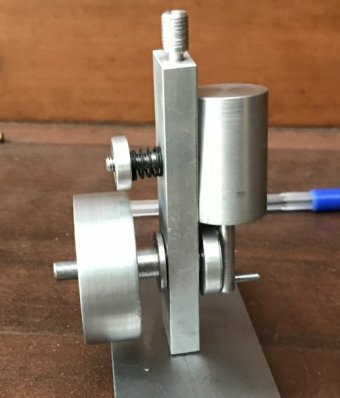 Col from the East coast of Australia built a copy of the engine out of aluminium. As a first project Col got a nice finish on the parts and a working result from the build. 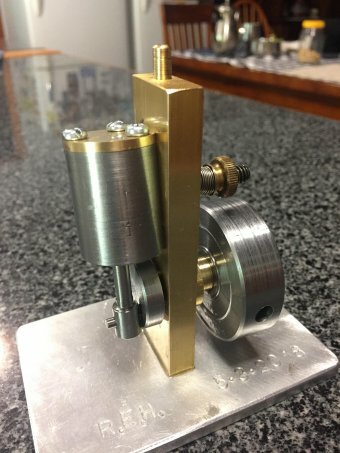 Gary got creative with his build of the engine, making a customised frame and stand assembly. 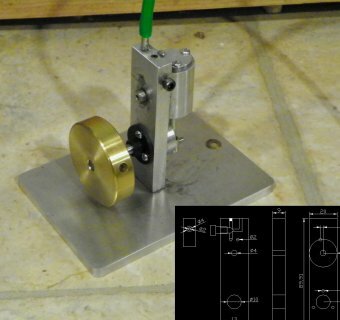 He also added spoke holes in the flywheel and a counter-balanced crank web. The end result looks great and the curve of holes over the top are particularly stylish.